Not only has there been difficulty finding consensus on a name for driverless, autonomous, self-driving, or automated vehicles, there is also the issue of what we actually mean when we say a vehicle is self-driving, automated, and so on. Do we mean that the vehicle can drive itself anywhere at anytime, with no one inside it? Or that the vehicle always needs someone inside ready to take over just in case? Or that the vehicle can drive itself, as long as it is within certain constraints, such as good weather and in a defined area of operations? In order to bring clarity to this situation, two regulatory bodies covering the United States have defined very similar levels of vehicle automation, with the second bringing greater clarity and now used as the standard. The first body to define levels was the US Department of Transportation's National Highway Traffic Safety Administration (NHTSA). However, its definition of the most automated level of driving was found to be too broad, and so the SAE International (initially established as the Society of Automotive Engineers) levels were developed, building on the earlier NHTSA work. NHTSA released a policy on automated vehicles in May 2013 that defined automation Levels 0 to 4, with automation increasing from Level 0 up to a fully automated vehicle at Level 4. The SAE levels that superseded the NHTSA levels in October 2016 defined Levels 0 to 5. For both sets of automation definitions, the Levels 0 to 3 were extremely similar. But what the SAE definitions do is sub-divide the fully automated NHTSA Level 4 into SAE Level 4 and Level 5. • At SAE Level 5, the automated system can perform all driving tasks, under all conditions that a human driver could perform them. A vehicle with Level 0 automation is one with no driver assistance features whatsoever. Many modern vehicles will have a single driver assistance feature such as cruise control, and therefore would be defined as a Level 1 vehicle. Adaptive Cruise Control: The driver can leave the gas pedal alone and the vehicle will travel at a constant speed, and it will sense a vehicle in front and slow down to maintain a set gap. Lane-Keeping Assist: Controls the vehicle steering to help prevent the driver from unintentionally wandering out of their lane on the highway. Automatic Emergency Braking: The vehicle detects an imminent crash and applies the brakes to prevent, or limit the severity, of the collision. More and more vehicles now have Level 2 capability, particularly top-of-the-range models. In order for the vehicle to safely carry out some of the driving tasks, sensor suites are required that are similar to that which is needed for Level 3 and Level 4 driving. With Level 2 vehicles, however, the driver must remain in control of the vehicle at all times. The Mercedes Level 2 system is called Distronic Plus and uses advanced cameras, radar, LiDAR, and ultrasonic sensors in combination to sense what is happening around the vehicle. General Motor's Level 2 system is called Super Cruise, and is due to be released in 2017 after numerous delays. NHTSA are concerned at how safe the GM system is, as in situations where the driver has failed to respond (like during a medical emergency), since the vehicle stops in the road. The most advanced example of Level 2 vehicles on the road are probably those from Tesla. Their Model S and X vehicles that are equipped with the Autopilot system and are capable of being driven for extended periods without any input from the driver. Although Level 2 vehicles can give the impressions that they are doing all of the driving in certain situations, such as in congestion with "Traffic Jam Assist" or on highways using "Autopilot," it is critical that the driver remain vigilant at all times. Unfortunately, human nature means that some drivers trust these systems too much and expect them to operate beyond their stated capability. SAE Level 3 vehicles are considerably more advanced than Level 2 vehicles, as they are actually capable of taking full responsibility for the driving task on specific parts of a journey. When a Level 3 vehicle reaches the point where it is no longer capable of carrying out the driving duties, it will advise a driver that she/he must take back control in a short amount of time, typically tens of seconds or less. If this driver re-engagement does not happen in the specified time, then the vehicle will issue warnings more forcefully to gain the driver's attention. If these warnings also fail, then the system will bring the vehicle to a safe stop, most probably by the side of the road. The first example of a Level 3 vehicle that we can expect to see on the roads is one that can drive itself from on-ramp to off-ramp on a freeway. Astro Teller of Google stated that the Google Self-Driving Car Project achieved highway driving capability in late-2012, but they chose not to commercialize it. They allowed Google staff members to test the limited self-driving system, but they found that the staff put too much faith in the system—to the point that they couldn't be relied upon to safely take back control. Currently, there are no commercially available vehicles with Level 3 capability, but Tesla's CEO Elon Must has announced that functionality beyond Enhanced Autopilot, moving towards self-driving capability, will definitely be available by July 2017. Vehicles with SAE Level 4 capability are capable of driving for an entire journey, and even driving unmanned. However, their operation will be constrained in some way, such as detailed below. Limited to a geo-fenced area, such as paved streets in a defined area of town. Limited by adverse weather, such as falling snow, snow-packed roads, intense rain, thick fog, etc. Limited to a maximum speed, e.g., vehicles limited to 35 mph may be able to travel on most streets, but not on roads posted at 40 mph and above. Numerous low-speed, Level 4 shuttle demonstrations have taken place around the world, and several pilot projects have been undertaken to determine the feasibility of this technology. 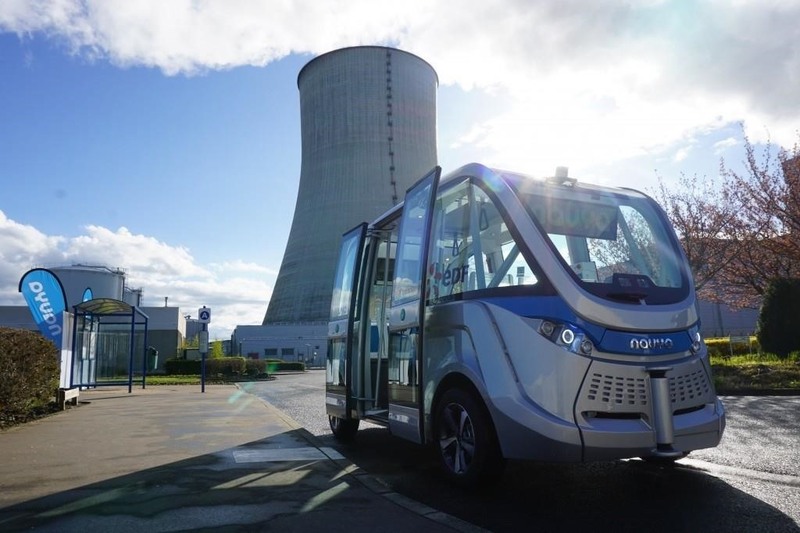 At the EDF's nuclear power plant in Civaux, France, there are 6 Navya shuttles transporting employees around this private worksite. Unmanned, unrestricted operation defines SAE Level 5 vehicles. They will not have operational limits like the Level 4 vehicles, and will be able to go anywhere at anytime. Some believe that vehicles with this level of capability may never exist. Some say that they will take a very long time. When Thinking Highways interviewed a panel of vehicle automation specialists in September 2014, both Steven Shladover and Alain Dunoyer thought that vehicles that would drive themselves to your day and take you places would be 50+ years away. Dr. Gill Pratt of the Toyota Research Institute believes that no one is even close Level 5 now, but that we will have such vehicles at some point. In a future article, we will explain why Level 5 vehicle capability should not be the primary goal, and that high capability Level 4 vehicles are all that is needed to transform our cities and our world. Liked the way you defragmented the article. I do have some observations, though. Many modern vehicles will have a single driver assistance feature such as cruise control, and therefore would be defined as a Level 1 vehicle. Vehicles can actually have several assistance features and could still be at Level 1. As far as these systems can allow the vehicle to either Brake and/or Accelerate itself, or Swirl itself to change the lane. That means either assist Longitudinally or Latitudinally. A combination of two or more advanced driver assistance systems (ADAS), where these systems sometimes help control either the braking, acceleration, or steering, is defined as a Level 2 vehicle. When a vehicle does both, assistance in Longitude (Braking) and Latitude (Steering), it is to be depicted that it has reached Level 2. The Mercedes system is called as Intelligent Drive.